The Angriest: Star Trek: The Next Generation: "Inheritance"
It is 22 November 1993, and time for another episode of Star Trek: The Next Generation. The Enterprise hosts two scientists who are attempting to repair a planet whose magma is inexplicably cooling. One of the scientists, Dr Juliana Tainer (Fionnula Flanagan), reveals herself to be the former wife Dr Noonien Soong - the cyberneticist who created Data (Brent Spiner). 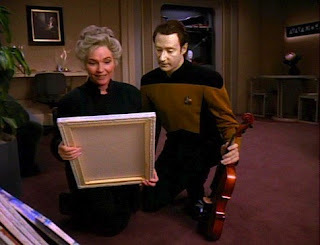 So after meeting a brother in Season 1, and a father in Season 4, Data finally completes his family set by meeting his de facto "mother". "Inheritance" is a weirdly flat and lifeless episode. The science fiction plot is so weirdly arbitrary and unimportant that it is barely worth noting. The development of Data and Dr Tainer's relationship is a meritable idea, but the execution is inexplicably dull. This is an easily skipped, readily forgotten episode. I actually had forgotten it completely when I came to rewatch it. The last time would have been some time around its original broadcast, and it clearly made no impact upon me whatsoever. The episode's first half is a very predictable series of 'cute' scenes in which Tainer fusses over Data, and gushes embarrassing childhood stories at his friends. Then things get a bit more dramatic when she faces how she abandoned him when the colony on which she and Soong lived was attacked. Data, of course, feels nothing at all, but that simply makes him act like a mirror to Tainer's own guilt. Then the episode hits its twist: that Tainer is herself an android created by Soong after the real Tainer died. She has been designed to grow old and eventually die, and is entirely unaware of her artificial nature. In itself it is a provocative story idea, but it immediately undercuts the entire survivor guilt plot that was already being developed. With this narrative right turn the dramatic question of the episode stops being about whether or not Tainer can forgive herself and love her son, but rather whether or not it is ethical to keep Tainer's android state a secret from her. And of course it's unethical. The series has, over seven seasons, gone to such extraordinary lengths to establish that androids like Data are sentient individuals worthy of the same rights as any other member of the Federation. Despite this, the decision is made to keep Tainer's secret hidden from her, and she finishes the episode none the wiser that she isn't human at all. It feels despicable, and puts the entire key cast - Data, Dr Crusher (Gates McFadden) and Captain Picard (Patrick Stewart) - in a very poor position. This episode could have been a minor diversion, but by shifting its storyline halfway through it just becomes a rather unfortunate waste of time. I've now watched 11 episodes of Season 7, and only five have been good. The quality ratio slips back down to 45 per cent.